I heard about this event on Radio 2 while driving home one night last week. I'm so curious to experience this phenomena! Join me in a night out at this Super-karaoke ! Ultimate Power is, quite simply, an evening of the greatest songs ever written. A communal appreciation of colossal musical compositions from the titans of Power Ballads; messrs Collins, Loaf, Tyler and Jovi and many, many more besides. Every single song is a classic, every single song is known and loved by all, and every single song is never played at any other club night in the world except Ultimate Power. 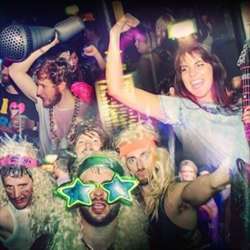 The joyous, harmonious atmosphere is unlike any other club in the UK; it is no exaggeration to say that it is a truly life-changing experience. Ultimate Power always promises you the best night of your life. Bring your Air instruments and throat sweets. Leave your inhibitions at the bar and come follow us to the promised land where pure balladic power will move you to your very core!